AbbVie, which fiercely protects Humira, the top-selling drug in the world, has reached a settlement agreement with a rival that's been trying to encroach with a cheaper alternative. In a deal announced Thursday, the North Chicago-based biopharmaceutical company will allow pharma giant Amgen's so-called biosimilar of Humira to enter the U.S. market in January 2023, and in October 2018 in Europe. To do so, Amgen must pay AbbVie an unspecified amount of royalties, and both companies will drop their court battle. "We are pleased to have reached this settlement with Amgen which respects the breadth and strength of our intellectual property portfolio," Laura Schumacher, an AbbVie executive vice president and general counsel, said a statement. "As an innovation driven bio-pharmaceutical company, we believe intellectual property is essential to protect the investment in science and advance novel cures for the toughest health challenges." In a separate statement, Scott Foraker, Amgen vice president and general manager of biosimilars, said: "Building on our strong inflammatory disease presence in the United States, we are excited to develop our inflammation capabilities in Europe, extending our reach and helping more patients gain access to this important class of therapies." Biosimilars, which are similar versions of brand-name drugs that aim to be more affordable, have gained steamed since the 2010 Affordable Care Act. While federal officials haven't approved many so far, these copycats have been thrust into the spotlight given the controversy around skyrocketing drug prices. 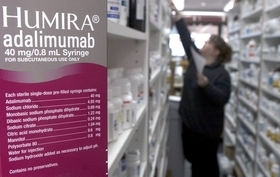 Humira, a brand-name drug, treats a variety of autoimmune conditions, including Crohn's disease and rheumatoid arthritis. The drug is core to AbbVie's business, expected to generate more than $18 billion in sales this year. That's 65% of AbbVie's total sales, according to a research note from Edward Jones. To protect this lucrative crown jewel from rivals developing their own versions that aim to be more affordable, AbbVie has built a wall around Humira with roughly 100 patents that have varying expiration dates. In 2016 AbbVie zeroed in on Amgen, perhaps it's biggest target, when it filed suit for patent infringement and essentially boxed Amgen's Humira knockoff out of the market. AbbVie alleged that Amgen, based in Thousand Oaks, Calif., "is speaking out of both sides of its mouth" because the company also has fought to protect its patents against rivals. The deal announced today "creates a level of assurance" for Wall Street investors that Humira sales won't be dampened by Amgen, at least not yet, said Tony Butler, a New York-based managing director and senior biopharma analyst at Guggenheim Securities. AbbVie's stock price was up about 5.5% Thursday morning, with shares trading around $89 a piece. Amgen's willingness to drop its legal fight against AbbVie might make other companies reassess their own court battles, added Erik Gordon, a University of Michigan professor with an expertise in entrepreneurship and health care. In a research note, Edward Jones analyst Ashtyn Evans said the deal is a win for AbbVie and "displays the strength" of Humira's army of patents. "Given the drug's complexity and market power, Humira should be able to maintain significant market share once biosimilars enter," she wrote. She added that AbbVie has to remain vigilant though. Once generics hit the market, insurers will put "significant pricing pressure" on Humira, Evans wrote. Still, there could be a catch (and a boost to AbbVie). Doctors who've gained a trust and affinity for Humira will have to be convinced to prescribe an alternative, Butler said. "AbbVie buys more time for top-selling Humira" originally appeared in Crain's Chicago Business.